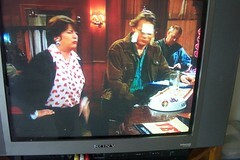 So the other night, it dawned on me that I am currently starring in my own version of Men Behaving Badly. I decided to make myself a lovely cup of tea, except when I tried to pour the milk…let’s just say that it didn’t ‘pour’ out so much as ‘glup’. I head to the fridge to get some more…to find that all I have in there is wine and beer. No milk. Being English, I couldn’t possibly drink tea without milk, so I went without and stormed back to the lounge with a glass of water. I also pause to notice that there is no food in my fridge…none. Actually, that isn’t entirely true…there was a packet of ham. Unfortunately, this was now quite far through the development of it’s own life forms, and had achieved moderate technology advances (internal combustion engine and the like…no space travel though). That, combined with bread that Alexander Fleming would have been proud to extract penicillin from…did not make for a potentially appetising snack. So, disgusted at this site, I close the fridge door so I don’t have to look at it. Well, I am not going to be responsible for the collapse of a fledgling civilisation…would you? On the way home from work, for this was a school night once more, a few of us decide to head to the pub for a ‘swift pint’. Cue lock-in at the bar and me stumbling upstairs at around 3am. I remember eating a pack of dried chillis, but chewing them as DS had simpy thrown a pack to the back of his throat and swallowed, and I am nothing if not competitive (read stupid)… I also remember B52s arriving…complete with straws. Mainly though, I remember that I couldn’t focus the next morning when I woke up. In fact, I woke up at 07:55. Trouble is, I am supposed to be at work at 08:30. I managed to shower, shave, iron a shirt (sort of) and get into a taxi at 08:05…quite impressive. The problems really started when I got to work and discovered that I couldn’t actually see my monitor…I look across the office at 08:25 and realise that I am literally the only person in at that moment. Not a good moment for still drunk Dave. Still, everyone showed up and I managed to (narrowly) avoid falling asleep in what felt like 100 meetings during the day. I went home and pretty much collapsed. Feeling fully refreshed the next day, meant heading to the bar after work..because yes, I am that stupid. Still, it’s Christmas right? So that’s ok. Still can’t believe I went to work drunk…or that I still have no food in my fridge. Oh, and the ham based lifeform launched their first test rocket today.